If you looked very closely in the last update, you might have noticed that the Robot design did not match the mechanical joints I had designed earlier. When comparing it to the chart, you can see that I actually made three pretty big changes. First of all, I skipped the torso folding. I couldn't get it to look good when I created the final shape, but luckily, it is not actually important. He can lean over using only his head/neck instead, it won't really matter. 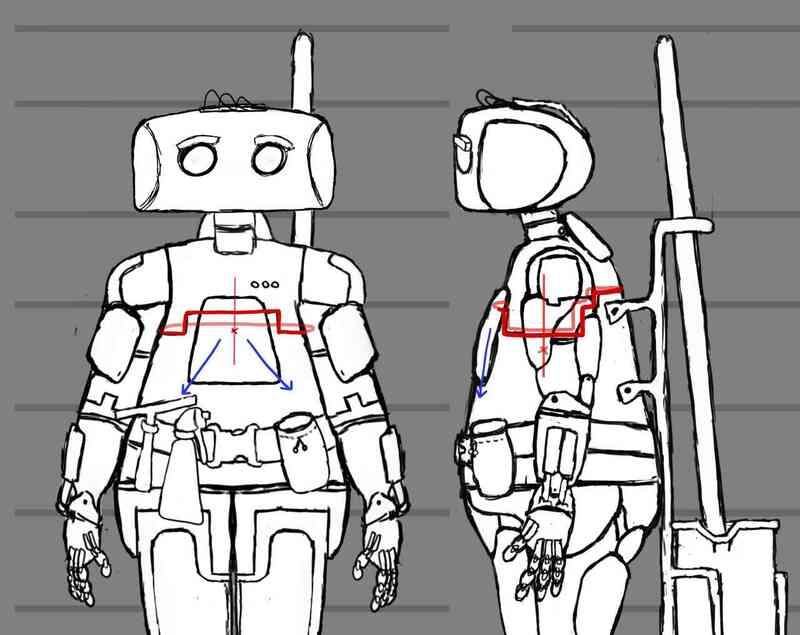 Instead I realized that turning the torso is potentially more important, since those types of movements happen much more often in the script (mopping, looking around, etc). So, I added the ability to rotate instead. The rotation will happen along the red line. (See the image above). 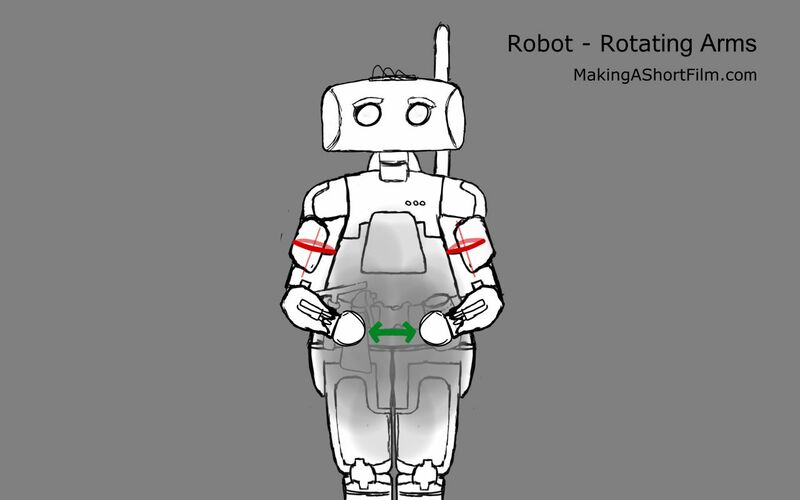 The covering plate in the center is actually in the way for this motion, but it will move out of the way when the torso rotates, as shown by the blue arrows. It would of course be easier to have no plate in the way at all, but the robot simply felt too empty and clean without it. Something was needed to break up that line across the torso. To which extent I will actually use this torso rotation is not decided. 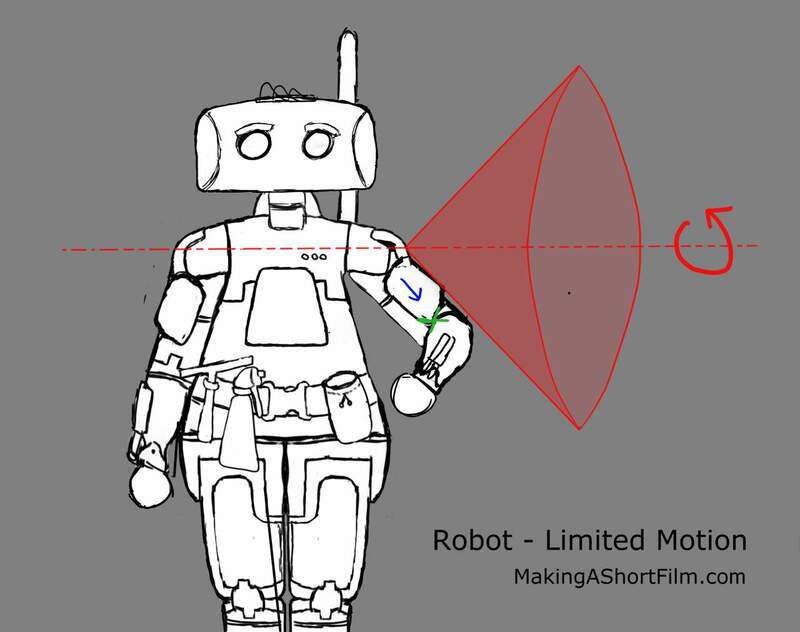 It depends on how I feel when I animate the Robot. If the upper body feels to rigid, I will use it, and if not, I will keep it in place. Either way, it is good to have that freedom later in the animation process in case it is needed. It is easier to not use something that is there, than use something that isn't there. Lastly, I added another motion as well, one I had completely missed. I gave the upper arm the ability to rotate (see the red lines by the "biceps" in the image below). This is pretty important for natural arm movement, being able to move the hands in and out relative to the body. Without it, it would be very difficult for him to hold things with his both hands since he can't regulate the distance between them (the green arrow). It would overall be very difficult to place the hands precisely without having to move the entire body all the time, which I believe would look (too) ridiculous. So, this will be much better! When looking at the final design it is quite clear that the motions will be pretty limited in some places, more limited than I had first thought. Not because of the number of joints, but because the moving parts on each joint can only go so far before intersecting with some other part of the robot. The perhaps biggest example is the lifting of the arm straight out. If you look at the image below, you can see that the muscle lifting the arm will very quickly intersect with the forearm. However, I think the travel distance will be enough For the moments where he will need to lift his arm high above (like placing objects in the ceiling), he can simply rotate it. This means that it is the red cone he won't be able to reach with his upper arm, which shouldn't be a problem when I think about the actions in the script. The exact limitation of all movements will be more clear once I have the rigged 3D model and can actually move the parts to see how far they can go before intersecting. Perhaps I need to shorten the muscle to give more room for the motion, but I will keep it like this for now. So, that's all about its ability to move. Now I will continue with the shading of the Robot (which is coming along pretty nicely). See you when it is done!